New Celtic striker Gary Hooper has made up for not getting his preferred number 10 jersey by choosing the unusual placing in the squad list. 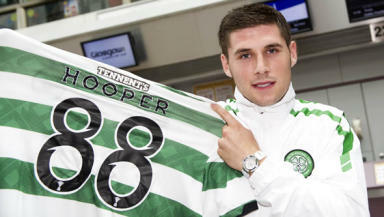 Gary Hooper will wear the number 88 on his jersey for Celtic this season, having completed his move from Scunthorpe United on Tuesday morning. The 22-year-old striker has chosen the number to represent the year he was born. Hooper wore 10 in the Championship last season but, with Marc-Antoine Fortune already in possession of that jersey, the Englishman has made a choice that will hopefully not reflect his place in the pecking order at Celtic Park. The £2.4 million signing could don the number for the first time on Wednesday night, if he is chosen to take to the field for his new club in their Champions League third qualifying round match away to Braga. Celtic’s other new signings have all also been allocated their numbers for the new campaign. Mexican international Efrain Juarez will wear four, Cha Du-Ri will sport the number 11, Joe Ledley will wear 16 and Charlie Mulgrew has been given the number 21 jersey. Scottish football fans have been treated to a handful of bizarre squad numbers in the SPL, with players from Hibernian, Aberdeen and Livingston making weird and wonderful choices in recent years. Derek Riordan sported 01 on the back of his Hibs jersey upon his return to the capital, with Colin Nish already in possession of the number 10 jersey. The late Hicham Zerouali wore 0 at Aberdeen, while Togo international Cherif-Toure Maman had the number 91 on his shirt when he joined Livingston in 2002. Celtic fans will also remember Porto keeper wearing number 99 in the 2003 Uefa Cup final, one of a whole host of players based abroad who have made interesting choices when it comes to picking their slot for the season. Ivan Zamorano lost the number nine jersey at Internazionale when Ronaldo joined the club, choosing to take 18. To account for his loss, he craftily added a plus sign between the two numbers. In 2008, city rivals AC Milan saw three of their players choose their squad numbers based on their year of birth. Andriy Shevchenko took 76, Ronaldinho wore 80 and Mathieu Flamini chose 84. It also appears Hooper isn’t the only player to have chosen 88 based on their year of birth. Salvatore Foti wore the number in his early days at Sampdoria for the same reason.